On Sunday 29 April, members from Sydney, Singleton, Prospect and Central Coast attended a BBQ and get together organised by WICEN NSW at the Amateur Radio NSW (ARNSW) site in Dural. WICEN like CREST is a specialist squad of the Volunteer Rescue Association (VRA) and has a team of experienced amateur radio operators that volunteer their time to provide field communications. WICEN put together an enjoyable information and education session which included information about up-coming communications events and some hands on technical demonstrations. These provided a great opportunity for members from both organisations to share their experiences of setting up communications networks. Those attending were invited to show off their field communications stations. 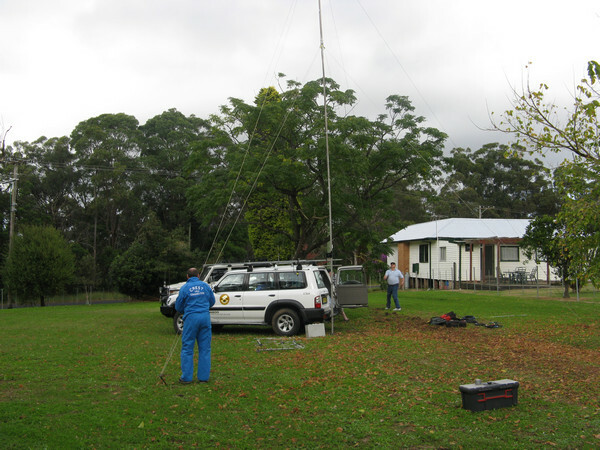 The Sydney CREST team set up a UHF repeater and portable mast and the team from Singleton / Central Coast demonstrated a VHF repeater with a crossband linked remote station with a standalone and vehicle mounted masts. A detailed review of the other stations on display can be found on the WICEN page here. Last night, CREST members past and present gathered with special guests at the Newcastle Diggers Club function rooms to celebrate 35 years of CREST NSW. Newcastle Lord Mayor Cr John Tate opened the event by extending a welcome to all the visitors to the Newcastle area and told the audience of Newcastle council’s high regard of CREST and its value to the community. He reminded the audience of CREST’s work during the east coast storms that hit Newcastle in June 2007 which were best known for the grounding of the Pasha Bulker bulk carrier on Nobbys beach. Senior Constable Tony Tamplin of the Newcastle Police Media Relations was the MC for the night. He told a very humorous story of his memories of drive-in theatres which unfortunately cannot be published here. Cr Peter Blackmore, Mayor of Maitland City Council told of his memories of the early days of CB radio. Cr Blackmore was a member of CREST for a short time after being quite active in the CB radio scene. Russell Ashdown, Commissioner, NSW Volunteer Rescue Association and Audrey Koosemen, President of the Native Animal Trust Fund spoke of the work of CREST NSW and their active relationship with the organisation. Mike Hallinan, Former NSW State Director spoke of the early days of CREST NSW and Mr Greg Ackman of Mobile One Communications Systems and Patron of CREST NSW Inc helped out with fund raising by drawing the raffle. There were a massive number of prizes donated by local and state wide businesses on offer. Last weekend CREST members from Newcastle, Central Coast and Sydney provided safety communications for the Kathmandu Adventure Series event at Glenrock State Conservation Reserve near Newcastle NSW. The weekend consisted of two separate identical events on each day. In parallel with the first day, CREST undertook a training exercise. The exercise focussed on the installation of a field communications network. CREST members set up a VHF repeater and VHF / UHF crossband system to cover the course. During record high temperatures the team assisted by arranging two ambulances to transport patients attended to by the on-site paramedics. After many tireless hours from CREST’s webpage team, the new webpage went live today. We have moved to a new open source content management system called WordPress which should prove easier for the entire CREST team to add their own stories. The webpage team designed their own WordPress template for the CREST site. If you have any feedback, please drop us a line via the contact page. CREST members from across NSW attended a training day held in conjunction with a State Council meeting in Northern Sydney. The training session focussed on mapping and navigation and forms an important component of the CREST Level 1 training qualification. A presentation covered different map types, the features of a topographic map, coordinate systems, measuring distances and bearings. The teams used mapping tools, different types of compasses and GPS receivers. A desktop exercise was held where various coordinates were identified and measurements were made. A quick demonstration of radio repeater site planning was covered. The day concluded with a outdoor navigation activity. Over the weekends of 17 / 18 and 24 / 25 of October 2009, CREST provided communications, marshalling and traffic control at 3 events for charity. It was then off to Lake Macquarie on Saturday 24 October where the multisport organisation Max Adventure provided the Great Adventure Challenge for the Starlight foundation. Corporate teams of 4 competed a course from Wangi Wangi to the Watagans and back consisting of kayak, mountain bike and rogaine (running) legs. Teams could swap members from a pool of 8 to complete the course and all had support crews to keep them sustained for the event. CREST operated a safety radiocommunications network between each of the transition areas and also provided timing information back to the start / finish line. Last year’s event raised over $50,000 and organisers are hoping that this year’s total will be a new record. It was a sea of pink on the Newcastle foreshore the following day where 18 CREST members assisted the Avon Race for Research a fundraiser for the Breast Cancer Institute of Australia. 3100 people entered the 5km walk or run along Newcastle’s beaches. CREST provided traffic control, marshalling and safety communications over the course. 17 January 2009: Newcastle CREST received a call via the channel 5 / 35 UHF CB Emergency repeater following a four wheel driving incident at Stockton Beach. A member of the public called for help after coming across a 1974 soft-top Land Rover that had rolled and one of its occupants required urgent help. Newcastle CREST’s Tristan Blackburn took the call and relayed the details to the emergency services. NSW Ambulance, the Westpac Rescue Helicopter, Police Rescue & SES responded to free the occupant. Media reports indicated that the Land Rover was on the top of a sand dune when the driver’s side wheels went off the edge and caused the car to roll. The 23 year old female passenger was believed to have been thrown from the vehicle before it rolled onto her. The woman was transferred to hospital in critical condition. Newcastle CREST monitors the 5 / 35 Emergency repeater located at Charlestown NSW. CREST volunteers keep a “listening watch”for calls of assistance from members of the public with a UHF CB radio. On Friday 28 August 2009 the annual Oxfam Trailwalker commenced in Sydney’s north. The fundraiser held by the charity Oxfam is an event where teams of 4 people walk or run over a 100 km trail through Sydney’s northern bushland and National Parks. Sydney CREST has provided communications support for the last 10 of the 11 years that the event has been held. A network of fixed and portable radio repeaters are set-up and are linked together to provide safety communications to each of the checkpoints along the course. This year 500 teams (that’s 2,000 individual participants) commenced the walk of 100km principally on the Great North Walk from Brooklyn on the Hawkesbury River to Georges Heights near Middle Head on Sydney Harbour. Each year, teams have 48 hours to complete the course however the fastest teams typically complete the course in under 14 hours. Teams are required to raise a minimum of $1000 each. In 2008, over 2 million dollars was raised for Oxfam. These funds support Oxfam’s work in 26 countries including indigenous communities in Australia. The event is a multi-squad Volunteer Rescue Association (VRA) event. VRA Bushwalkers Wilderness Rescue also assists Oxfam with the event by “extracting” injured walkers from the trail, providing operational logistics in the control centre and sweeping some trail sections to ensure that all walkers are through. CREST has been assisted by other VRA squads including the NSW Cave Rescue Squad and Wicen. Members of the Manly Warringah Amateur Radio club also provide operators to man the CREST control station.